A Fathead minnow is a small raised fish with a length ranging between 2 and 3 in. It has a mainly orange colour. They will not fall ill very soon, nevertheless it will not reach a very old age. Maximum two to two and a half years. A minnow is a school fish which feels good in the company of ten to twenty congeners. Your pond should locally have a depth of at least 29 inch preferably have some planting, however, it also should a few open areas. 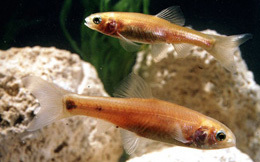 A Fathead minnow can be kept along with all other species of pond fish. A shallow area of maximum 4 inch with many oxygen producing plants is recommended for propagation. A Fathead minnow likes balanced easily digestible feed.